I'll post fishing tales if we catch something! Three people, relatively new to the sport. Also any good guide recommendations (patient!)? As fishmaster it is safe to say that there were a few errors in judgement that I attribute to myself - although with time I am pretty sure I will be able to shift the blame elsewhere. The good - The Clark Fork and the middle fork of the Stanislaus are both beautiful and even in September of this moderately dry year they both had enough cold water to make them fishable. And, everyone caught fish. More good - We BBQ's brats on Friday night and had pancakes on Saturday AM before heading out to fish. Food was good and a couple of good bottles of wine were donated to the cause - much thanks to Patrick Stauter. The bad - No water in the campground. First time here and I must have missed this notation. Fortunately for us, and unfortunately for the environment, we had a case of bottled water. Might want to avoid the Brightman Flat campground if you are in the area. The ugly - opening day of deer season. Campground was packed to overflowing. Loud music, some interesting late night arguments and a general ambiance that fell below expectation for a wilderness outing. The local reports say the Yakima has a caddis hatch in full swing. Catches are reported to be 50-100 trout per day... Not bad for a fish story! Every trip to the mountains has its own unique character or singular experience that creates a memory that lasts forever. The trip over Shepherd’s pass trail this year in search of golden trout was no exception. Rosy colored memories of the prior year's experience where a large golden trout broke the leader with a swish of a gigantic tail obliterated any memory of the long and grueling hike over the pass. The majestic rise of the eastern Sierras from the 6000 ft desert environment to touch the clouds can only be understated as – impressive in the morning sunlight. Slowly, comprehension of the arduous task ahead sunk in as we realize the Front Range hides a taller summit behind it. Shepherd’s pass trail has the reputation of being long, steep, hot, and difficult. The trailhead is the desert at 6200 ft and it finally crests at 12000 ft. In the beginning it starts with a warm up of 55 switch backs to reach a saddle at 9000ft for a breather. Then a teaser descends 500 ft before the accent begins again in earnest. After seven hours with a week’s food plus more, weighting our backs, we prayed for the last switched back turn as our feet plodded on, one slow foot step at a time, toward Anvil camp. After 7 hours of increasingly more enfeeblement we reached Anvil camp at 10000 feet. There were no complaints about the early fall sunsets as we ate supper quickly and fell into the exhausted sleep of the dead for a long night of rest. The next morning we woke refreshed ready to go. We scampered up Shepherd’s pass. It was surprising how little snow was on the pass given the large amount of snow we all experience in northern California mountains. We paused at the top long enough to see the small golden trout jumping in the morning sun at Tyndall Lake. In the azure blue of a mountain glacier we watched the floating icebergs, and were enthralled by the long mountain views. Shepherd pass at 12000 ft was where we saw our last person for five days. But following the spirit of The Higher; The Fewer we crested the next 12000ft pass on our cross country sojourn before lunch. Driven by the fever of anticipation to engage large golden trout we chartered our course by wind and the sun to the designated campsite. But a first time cross country path, “short cut”, is always fraught with unexpected obstacles --- like a boulder field. Some wanted to go around high, some wanted to go around down and low, some did not know which way to go. Thus it was another long day before we all made it safely to our designated base camp 9 hours later. We spent the next couple of days exploring all of the lakes in the basin. My GPS says I explored 10 lakes and covered over 10 miles of high altitude country side. I even visited the highest fishable lake in California at 13000ft. Fishable is somewhat of a misnomer. It was surrounded by a glacier of penitent snow. I noticed the glacier ice shelf extended out over the water. Not wanting to end up on my own private iceberg chapel, I refrained from visiting the waters edge. While I was exploring the high mountain lakes and creeks with a fly rod I felt like I could see forever over the horizon. I remember falling asleep in conversation with a babbling brook (almost like home?) in the warm afternoon sun, dreaming of golden trout on the fly, with far away vistas to the ends of the earth. But back to the quest, below is an example of a 15 inch wild golden trout that elected to show himself to the camera. Afterwards it was quickly released back into the water. It was only one of many others, most of whom were returned to the water. After multiple days and multiple meals of golden trout in foil, we migrated over to a nearby basin for further exploration. Along the trail we did pass a couple of people. These were the first people we had seen since Shepherd’s pass. Again, when we got to the target basin there were no people. There were many lakes, some reputed to contain small golden trout. But the only answer we got to the various fly presentations was from some nice mountain rainbows. They fought and jumped like fish twice their size. The weather for mid-September was forecast to be mild and sunny. However on the last evening the red sky suggested a significant change was in the air. On the day of departure we were up early and watched the sun light up some large cumulus clouds as we packed. From the vantage point of 11,000 ft it seemed as if we could almost reach up and touch those large puffs of cotton candy. Knowing the low clouds represented a lot of moisture in the air we quickly headed out over the passes. The expectation of a future thunder storm was high. Indeed we encountered stormy sleet, traveling sideways in the wind, interspersed with peels of thunder rattling down the canyons on the way out. Given the sleet, the wind chill must have been well below freezing. But by then we had crossed the passes and were on the downhill slope to the car. As we descended back into the desert, the howl of the wind was relegated to the high recesses of the mountain crevasses. Lower down, along the trail the fresh rain had caused some of the late fall flowers to bloom one last time before the snowy, white blanket of winter descends for the season. As always, it was a trip to be remembered. We explored high mountain drainage basins, laced with golden trout without another person in sight. We saw massive peaks reflected in the still waters of the morning sun, and shared far away evening sunsets with friends. Best of all, we left plenty of large golden trout behind for a future return engagement. The Owyhee River is a catch and release, tail-water fishery in southeastern Oregon. 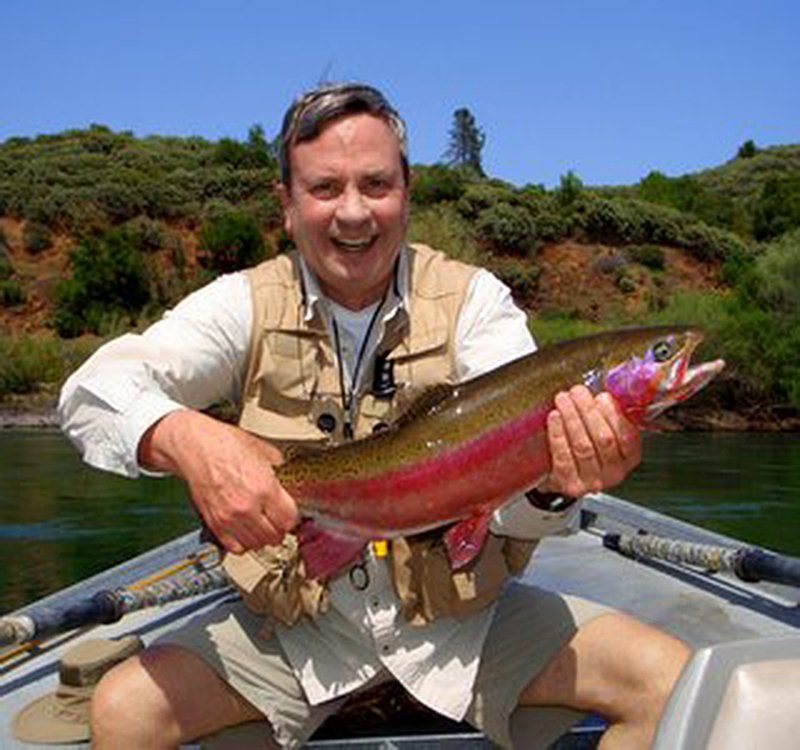 Open year-round, the Owyhee is known for its large brown trout, along with some rainbows. The river flows through a spectacular canyon, the walls layered with volcanic rocks that look as if they could have erupted yesterday. The Owyhee is approximately a 12 hour drive from San Francisco, Mike McGuire, John Files, Mike Pinelli, Fred and Barbara Stevens drove to Winnemucca where we spent the night. After breakfast we traveled to the small town of Adrian, Oregon for fishing licenses and lunch. We then convoyed to the Owyhee River where we met our guide, Steve Cooper. Steve had arranged for a camp at one of the few shaded properties on the river and set up several tents with cots, a screened area for dining, and an outdoor kitchen. We quickly unpacked, settled into our tents, received a fish report from Steve, and made plans for our fishing adventures. Adding to our group was Mike’s son Andy who joined us the next day. The weather was sunny and warm, punctuated one day by a thunderstorm that cooled the air and settled the dust. Fishing was great. We caught browns and rainbows up to 24 inches, all healthy and strong. We split into three groups, Steve spending time with each of us, explaining the hatches and techniques that work best. Dry flies included grasshoppers, small dries (sizes 16, 18, and 20s) such as baetis, caddis, and midges. A hopper-dropper set-up worked well with the dropper being any small midge or nymph pattern, and when the daylight faded, the same hopper trailed by a small dry fly. The Owyhee is not a crystal clear river. It didn’t affect the fishing, but the lack of clarity in rocky areas made a wading staff helpful. For still-water anglers, there were numerous quiet stretches where a float tube could and was used to fish hard to reach spots, like far banks. Often while wading, we saw brown trout feeding leisurely in the shallows on the other side of river, safely out of casting range. All too soon our trip came to an end. The Owyhee trip was memorable for the great company and fishing, as well as the excellent food provided by Steve. Spent the second weekend in September fishing the Clark Fork. As we drove up on Friday evening we were met with a pretty good Sierra thunderstorm. Not really a big surprise but it was nice to know that we had packed the tent AND the rainfly. The weather abated as we crested the summit and headed down to the Dardanelle Campground near Kennedy Meadows. The weekend after Labor Day one can typically expect the campgrounds to be pretty empty. We arrived around 4PM and had no trouble finding a nice site. We set-up our usual, everything but the kitchen sink, car camping camp and headed out to try our luck. The streams in this area are beautiful but suffer somewhat from the proximity to the campsites and the fact that they are not catch and release. That said, the fish were small but very accommodating. I was fishing with a first time fly fisher so the conditions were perfect. The water levels looked more like late June than early September. The weather remained iffy all weekend the nights at 6500' were definitely on the cool side. Neither was a real problem. This is a great place to go, although it tends to get very crowded in mid-summer. Lot of small lakes and streams in the area an as always, if you get more than a 1/2 mile from the road you will most likely be alone.